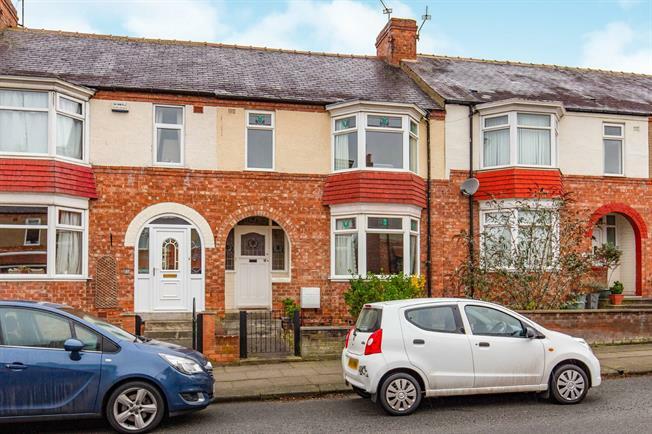 3 Bedroom Terraced House For Sale in Darlington for Offers Over £125,000. Located in the ever popular Cockerton area of Darlington this attractive, period three bedroom town house style property comes with bags of charm and character. The property comprises in brief porch, entrance hall, lounge, kitchen dining room, utility space, first floor landing, three bedrooms and family bathroom. There is an attractive front fore court and rear yard. The property is heated by gas central heating and benefits from uPVC double glazing. Providing access to the lounge and kitchen diner with stair case. Situated to the front of the property benefitting from a bay window, cornicing, picture rail and attractive gas feature fireplace. Fitted with a range of wall, floor and drawer units this kitchen dining space also benefits from French doors leading out to the rear yard. Situated to the front of the property with bay window, original, attractive feature fireplace and built in storage. Situated to the rear of the property with built in storage. Situated to the front of the property and currently used as an office space. Fitted with a suite comprising shower unit, bath tub, low level WC and pedestal wash hand basin. Rear enclosed courtyard and front forecourt.